Chad Young is a co-host of The Morning Show and also serves as Program Director for Talk 104 / 93 WKCT. He is a 2001 graduate of WKU with a degree in Print Journalism. His journalistic career began in high school when he traded in his pizza apron and began working at his hometown newspaper,The Connersville News-Examiner, where he got to cover public meetings, conduct interviews and take pictures at the fair. 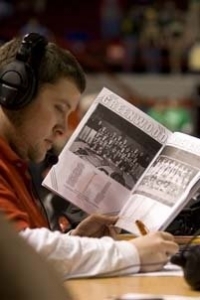 He then moved into public relations working in WKU’s Athletic Media Relations department as an undergrad, helping with Hilltopper football and basketball games as well as being responsible for the golf and tennis programs. His career in broadcasting coincides with his employment with Daily News Broadcasting in 1999. His first job was to take transmitter readings overnight on the weekends. He then begin anchoring weekend newscasts on WKCT before becoming the local producer and anchoring newscasts weekdays on The John Boy and Billy Big Show on WDNS. In 2001, he hosted his first program, a sports talk show with former WKU Lady Topper coach Steve Small, called The Right Call. He became WKCT’s Program Director in 2003 and fired himself in 2008 when WKCT added Sean Hannity to their afternoon lineup and moved Drive Time to 5:00 p.m. A year later, he took over for Roy Brassfield and became the host of Drive Time where he conducted interviews with everyone from legendary pop stars like Neil Sedaka to local politicians, and hundreds of authors in between. Chad served as a fill-in host on Mornings with Darrell and AL almost from the time he began at the station which made the transition easier when took over the program in 2014 when his predecessor, Darrell Duvall, first became ill. He and co-host, Al Arbogast, had a ready-made chemistry and a rapport established after years of working together on the air and off air when they shared an office. 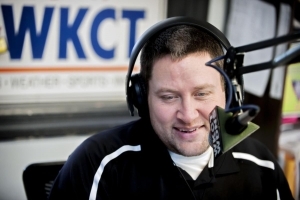 Chad is also in his 14th year broadcasting high school football and basketball on Talk 104 / 93 WKCT and has served as “The Voice of Gator Football” since 2008, providing listeners a front row seat to the most successful era in program history. 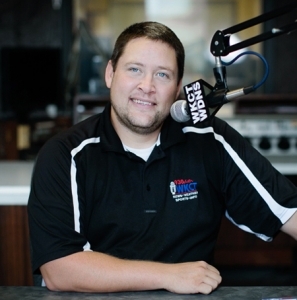 He also served as the Public Address Announcer for WKU football from 2003 until 2013. An avid tennis player, he is a past president of the Southern Kentucky Tennis Association and coaches the boys and girls tennis teams at South Warren High School.